1. a person with a strong concern for human welfare, values, and dignity. 2. a person devoted to or versed in the humanities, esp. a classical scholar. 3. a student of human nature or affairs. This definition certainly appeals to me and seems applicable to my personal outlook. Unfortunately it does not typify the average human’s perspective. Indeed, many cult religious factions harbor a definite anti-human slant and deplore humanism as evil. It is well and good to be flexible, as with any reasoned approach, change must be expected in available knowledge. I do think measures should be taken, however, to insure that the movement is not hijacked by the myriad factions which exist that encompass the goals of humanism yet have other goals as well. I can agree with this scientific view of knowledge acquisition fully. The “critical intelligence” tool of examination could use a little refinement as to its actual meaning. One man’s critical intelligence may be another’s tomfoolery. Once the existence of a deity is dismissed one would think this would be straight-forward. If we arose by evolution, then of course we are integrally a part of this world and nature. Our differences with the rest of the life-forms on this planet must be carefully utilized and made to serve good and moral purposes. I would hope that “making informed choices in a context of freedom consonant with responsibility.” means that one person’s idea of how life should be lived should not interfere with another person’s concept of how to live. This is most difficult to observe in reality. What if the mere presence in plain view of one’s idea of how to live one’s life is an abomination and interferes, in fact, causes great stress to another. The energies needed for toleration can be a source of stress in a lot of instances. Toleration does seem an idealistic, perhaps unrealistic, expectation in some imagined scenarios. It is not entirely clear as to what they mean in this particular section. In fact, it sounds almost like “faith”. A faith in humanity. Perhaps “hope” would be a better word. Strictly speaking, it is this trait which allowed us to survive. Cooperation, relying on one another, empathizing with each other’s needs and wants. Unless humanity can begin thinking of the whole of humanity as one instead of separate collections of human beings there will always be the possibility of disagreements leading to violence. Looking at human existence today it seems this desire for universal peace is another unrealistic idealistic perspective. Socialism? “just distribution”? Who is to decide what is just? Those that contribute more should have more? How much more? What is just? How to reward for extra effort? Doesn’t talent count? There are many good and decent ideas that are overly difficult or nearly impossible in their manifestation. Humans have always been wary and suspicious of others that are different. Are humanists human? Respect may be a tall order and the wrong thing to expect here. Perhaps toleration would better fit the bill. The responsibility to maintain the planet’s natural state is good. ► Without the ancient religious beliefs we must, I agree, realize that we are responsible for our own futures. There is no god, or gods, looking out for the safety or continuance of humans. There is only us. Am I a humanist? Only in the strictest definition as defined at the beginning. I am not part of any specific organization. Unless I can ascertain the purity of any organization, that is, that it is free from influence by other factions, I am not likely to be a part of any such organization in the near future. 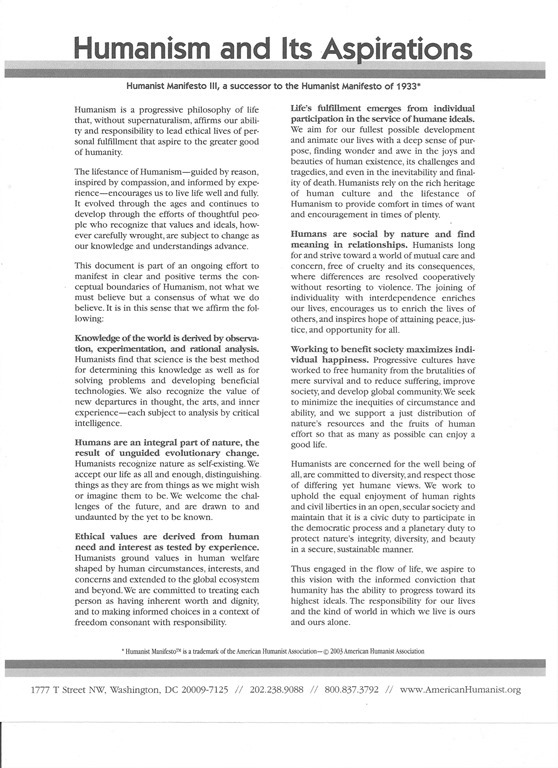 This entry was posted in Reason, Religion and Reason and tagged Humanism, humanist. Bookmark the permalink. Looking further into the American Humanist Association site revealed they have a feminist chat group by the name of feminist caucus. Looks like humanism is tainted with feminism as well.